Use this form to enter the 2019 NPC EAST COAST CLASSIC online, with secure online payment by credit or debit card. THIS EVENT IS OPEN TO ALL U.S.-BASED COMPETITORS INCLUDING MARYLAND RESIDENTS AND RESIDENTS FROM OUTSIDE OF MARYLAND. If you want to enter the MARYLAND STATE event as well, complete that form separately (maryland residents only for that event). After completing the form, you will be entered instantly and receive a confirmation (check your INBOX and SPAMBOX). This form will not work properly on MICROSOFT INTERNET EXPLORER OR EDGE BROWSERS. Please use Chrome or Firefox. Registrations submitted after June 24 at 6pm EASTERN will be $100 per class, plus a $100 late fee. YOUR STREET ADDRESS AND ZIP CODE MUST MATCH THE CURRENT ADDRESS WHERE YOU RECEIVE YOUR CREDIT CARD STATEMENT. NOTE: You will only receive emails from us or our trusted associates in the fitness community. I hereby give permission for Kutz Promotions and its trusted partners to send me emails about contest and fitness related information. I do not want to receive any emails other than confirmations about events. CHOOSE CLASSES BELOW: Please check each division you wish to enter. $100 per class. For CLASSIC PHYSIQUE, your competition bodyweight is regulated by your HEIGHT, so you must fall within the ranges shown in the dropdown menu below (on contest day). You may ALSO compete in Men's BB or Men's Physique, if you wish (crossovers are permitted). If you DO fall within the required height/weight ranges, you will be prompted to select your classes for Classic Physique. SELECT your classes for Classic Physique below. If you compete in OPEN, you may also crossover and compete in an additional class, if you wish. ($100 per class). If you do not fall within this height and weight range at check-in, you will be permitted compete in Men's BB or Men's Physique instead. Sorry, if you do not fall within the height AND weight ranges shown, you cannot compete in Classic Physique. Please choose to compete in MEN'S PHYSIQUE or MEN'S BODYBUILDING elsewhere on this form. Crossovers ARE permitted between Classic Physique, Men's BB, and Men's Physique. ALMOST FINISHED: CLICK the "NEXT" button BELOW to review and confirm your choices. Your ENTRY IS NOT COMPLETE UNTIL YOU CLICK SUBMIT on the next page! Your entry is almost finished. Please review the information your entered below, and if it all looks correct, click SUBMIT at the bottom to COMPLETE YOUR ENTRY. If there are any changes to be made, click PREVIOUS at the bottom to go back. YOUR ENTRY IS NOT COMPLETE UNTIL YOU REVIEW THIS PAGE AND CLICK SUBMIT AT THE BOTTOM. Use this form to enter the NPC Maryland State Championships ONLINE, with secure online payment by credit or debit card. THIS EVENT IS OPEN TO MARYLAND STATE RESIDENTS ONLY. If you are from outside of Maryland, please enter the NPC EAST COAST CLASSIC which is held the same day and is open to all NPC US athletes. That form is on the home page of the site. After completing the form below, you will be entered instantly and receive a confirmation after submitting the form. This form will not work properly on MICROSOFT INTERNET EXPLORER OR EDGE BROWSERS. Please use Chrome or Firefox. IF YOU WANT TO COMPETE IN CLASSIC PHYSIQUE, your competition bodyweight is regulated by your HEIGHT, so you must fall within the ranges shown below (on contest day). THERE IS NO MINIMUM WEIGHT FOR EACH HEIGHT RANGE, only a MAXIMUM WEIGHT, which you may not exceed for the heights shown. If you do not fall within the ranges shown below, you are not eligible for Classic Physique, but may compete in the Men's BB or MEN’S Physique divisions instead. For Classic Physique, CLICK THE DROPDOWN MENU BELOW to select if you fall within the required height/weight ranges for this division. Note: Crossovers ARE now permitted for athletes who wish to compete in Men's BB, Men's Physique and Classic Physique. If you compete in Classic Physique, you may also compete in the others. TOTAL FEES TO BE CHARGED: The GRAND TOTAL field will calculate after you choose classes and click agreement to terms above. 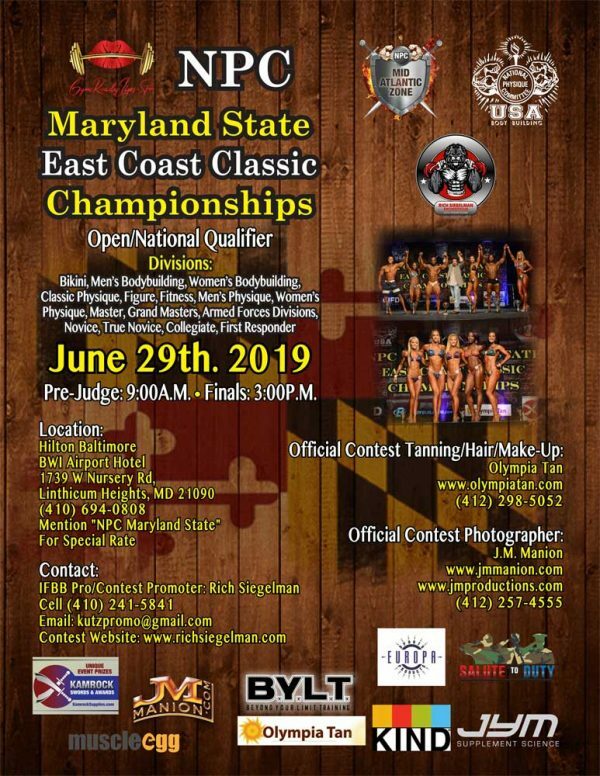 Order Finals or Prejudging Tickets for the NPC 2019 Maryland State Championships / East Coast Classic. Order direct here and pick up at will call or athlete check-in! FILL IN THE FORM BELOW TO ORDER YOUR TICKETS ONLINE NOW for prejudging, finals or both. ALL ticket orders must be picked up at Will Call or athlete check-ins with ID. YOUR STREET ADDRESS AND ZIP CODE MUST MATCH THE CURRENT ADDRESS ON YOUR CREDIT CARD STATEMENT. If the address where you live is different, or you recently moved, please be sure to enter the address on file with your credit card company here. CHOOSE THE TICKETS YOU WANT BELOW -- either prejudging for $40, finals for $50, or a package of BOTH prejudging and finals for $80. A 7.95% processing fee is added to all orders. THE CREDIT CARD MUST MATCH THE ADDRESS YOU PROVIDED AT THE TOP OF THIS FORM (your credit card billing address). CLICK the "NEXT" button BELOW to review your ticket order. Your order IS NOT COMPLETE UNTIL YOU CLICK SUBMIT on the next page! Your order is almost finished. Please review the information you entered below, and if it all looks correct, click SUBMIT at the bottom to COMPLETE YOUR ORDER. Do not click the submit button more than once! If there are any changes to be made, click PREVIOUS at the bottom to go back. BE PATIENT AFTER CLICKING SUBMIT. You will receive a confirmation on-screen within about 1 minute after you click SUBMIT. If you do not receive an on-screen confirmation, contact 800-929-3539. YOUR ORDER IS NOT COMPLETE UNTIL YOU REVIEW THIS PAGE AND CLICK SUBMIT AT THE BOTTOM. TWO SEPARATE EVENTS ON THE SAME DAY! NOTE: All Crossover Classes ( Example: Masters, Grandmasters, Armed Forces Etc.) are available to ALL Athletes and are on the East Coast Classic Registration Form. COMFORTABLE, CONVENIENT VENUE FOR THE EVENT! Mention NPC Maryland State/East Coast for special rate. You may register ONLINE USING A CREDIT CARD or by Mail with the form linked below. Registrations ONLINE are easier and faster, and you get instant confirmation! $100 registration fee includes your first class, plus $100 crossover fee for EACH and EVERY additional class you choose. Online Registrations will be available through June 27, 2019 at 1pm Eastern. Registrations sent by mail must be postmarked by June 25, 2019! No Exceptions! DO NOT MAIL Registrations after June 25, 2019! NO REGISTRATION OR CHECK IN FOR THE CONTEST ON SATURDAY, THE DAY OF THE EVENT!! Mandatory Check-in On Friday June 28! ON FRIDAY June 28 between 4 pm and 7 pm at the HOST HOTEL! Print Out, Complete it, and Send it In with Money Order. Payment by MONEY ORDERS ONLY! The Hilton Baltimore BWI Airport Hotel is the CONTEST VENUE and the host hotel for the event. SAVE $10 WHEN ENTERING THESE EVENTS, thru April 30! For discount on Maryland State, enter coupon code 10MD in the coupon field on the entry form. For discount on East Coast Classic, enter coupon code 10EC in that event’s entry form. Athletes who are Maryland residents may choose to compete in one or BOTH events by completing BOTH entry forms. A 7.95% service fee is added to all credit card ticket orders. No Refunds on Tickets for Any Reason. Dumbells are NOT permitted in the pump-up area. Competitors are advised to bring exercise bands. Competition is open to all NPC registered athletes. PLEASE NOTE: Your NPC CARD is NOT the same as entering the event! It is your registration as an NPC athlete. To enter the event, click the ENTRY tab at the top of this page for information. See the rules for MUSIC below. All Bodybuilding, Classic Physique, Women Physique and Fitness contestants MUST supply their own music (70 seconds for all divisions, except Fitness, which gets 2 minutes of music). You may UPLOAD YOUR MUSIC in advance of the contest by clicking this link, or bring a CD. BRING A COPY OF YOUR MUSIC ON CD EVEN IF YOU ALREADY UPLOADED IT! Your CD must have ONLY YOUR SONG SELECTION ON IT! NOT complete CD’s or songs, only the 70 seconds of music you will use (or 2 minutes for Fitness competitors). ALL MUSIC WILL START WHEN THE COMPETITOR NAME IS ANNOUNCED. Vulgar music is NOT be permitted and will be grounds for disqualification. ABSOLUTELY NO REGISTRATION / CHECK-IN AT VENUE! Competitors have NEVER competed in the NPC before. Competitors have not won their class in an NPC competition. Competitors are Active or Retired with First Responder ID. Competitor must be at least 16 years old, and not over the age of 19 on the day of the competition. Competitor must be taking college courses during that calendar year and must not be over 25 yrs of age. Competitor must not be over the age of 23 on the day of the competition. Competitors must be over the age(s) shown on the day of the competition, such as “Over 35”. FOR LIST OF ALL DIVISIONS IN THIS EVENT, PLEASE VIEW THE OFFICIAL ENTRY FORM from the ENTRY TAB ON TOP OF THIS PAGE. 2 Rounds of competition. Wearing a 2-piece suit with heels. Each competitor performs a Front Stance and 3 model stances. Competitors will be directed to do quarter turns in a group. Wearing a 2-piece suit with heels. Each competitor has 10 seconds to present themselves in the stances of their choice. Competitors will be directed to do turns to the front and back. Each competitor has 10 seconds to present themselves in front and back stances. 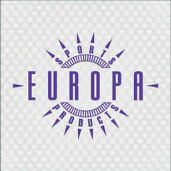 Contestants will be brought out in a group and directed to do stances to the front and back. Contestants will be brought out in a group and directed to 5 Mandatory Poses. Competitors will perform a 70-second posing routine to their own music at the Finals. If you do not make weight in the Classic Physique division, you will have the option of completing in Bodybuilding or Men’s Physique. Proper attire is required. Posing Trunks for Bodybuilding, Board Shorts for Physique. Any trainer’s pass must be purchased at the Weigh-Ins. $160 cash only. THE HOST HOTEL AND CONTEST VENUE ARE THE SAME. OR PHONE 410-694-0808 and mention “NPC Baltimore Gladiator” for special rates. Deadline to book your room at the discounted rate is March 15th or until sold out. You may register ONLINE USING A CREDIT CARD or by mail with the form linked below. Registrations ONLINE are easier and faster, and you get instant confirmation! Online Registrations will be available through March 20, 2019 at 6pm Eastern. Registrations sent by mail must be postmarked by March 19th, 2019! No Exceptions! MAIL IN REGISTRATIONS NOT ALLOWED AFTER MARCH 19. Mandatory Check-in On March 22! ON FRIDAY MARCH 22nd between 4 pm and 7 pm at the HOST HOTEL! Print it Out, Complete it, and Send it In with Money Order. Competition is open to all NPC registered athletes. You must have your NPC card! Final Registration will also be allowed at Athlete Check In at the Host Hotel the Day Before the Event, cash or money order only! YOU MUST BRING A CD WHETHER YOU UPLOAD MUSIC OR NOT! BRING A CD with your music — it must be a CD with ONLY YOUR SONG SELECTION ON IT! NOT complete CD’s or songs, only the 70 seconds of music you will use (or 2 minutes for Fitness competitors). Afternoon Athletes Meeting – 2:00 P.M. MORNING ATHLETES MEETING 7:30 A.M. AFTERNOON ATHLETES MEETING 2:00 P.M. Please review this information on descriptions of the various divisions then scroll down to see the classes for this event. Click the ENTRY FORM tab on top of this page for entry information. PLEASE NOTE: The weight ranges for classic physique have been increased by 5 lbs. If you do not make weight in the Classic Physique division, you will have the option of competing in Bodybuilding or Men’s Physique. Proper attire is required. Posing Trunks for Bodybuilding, Board Shorts for Physique. A 6.5% service fee is added to all credit card ticket orders. No Refunds on Tickets for Any Reason. TICKETS WILL ALSO BE AVAILABLE FOR PURCHASE AT THE DOOR MARCH 23RD, THE DAY OF THE CONTEST, and at ATHLETE CHECK-IN at the HOST/CONTEST HOTEL ON MARCH 22, 2019, the DAY BEFORE THE EVENT (Cash Only). CLICK HERE FOR NPC MAIN WEBSITE WITH PHOTOS, CONTEST RESULTS AND MORE!